As the wedding approaches, couples frequently ask “I need help with selecting key song choices for my wedding reception”. These special moments and formalities need to have the right music choice for sure. This is an opportunity for couples to personalize their reception with their favorite artists, songs, genres, etc. A professional DJ will have an extensive library to help couples choose the right songs. From your first dance, to parent/special dances, to the song used to introduce them into the ballroom. All these song selections can make your reception a memorable event. Many song choices are available for onsite ceremonies. From the bridal party processional, to the bride’s processional and finally to the couple’s recessional. You can use traditional/classical processional and recessional songs to instrumental string or piano covers of your favorite songs. This is a great way to have a unique and personalized ceremony. Again, a professional DJ will make suggestions and can create custom music edits for your ceremony. To create the right atmosphere a custom mix of music can be made to be played during cocktail hour. This can be based on the couples personal tastes and preferences on songs and/or artists. Another idea is to match the surroundings of the venue. If it’s a beach wedding, maybe a steel drum music set would be a great idea. Or if it is more rustic either some classic rock or country would be a great fit. Personalizing your introductions with favorite songs or genres of music, not only for themselves, but for your parents and bridal party as well. Be it EDM, dance, rock, hip hop, movie soundtracks, etc, a Professional DJ can make suggestions and create custom edits to make your introductions personal, fun, and exciting! The introductions set the tone for the entire reception. 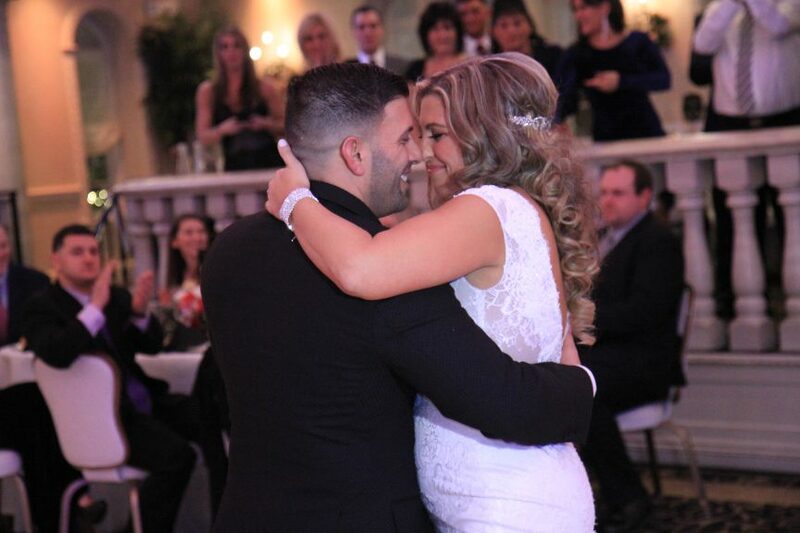 Selecting and sharing that special first dance with your now spouse in front of all your family and friends is a memory that will last a lifetime. Be it the first slow song you danced to when dating, to a song from a mutual favorite artist, take time to make it a meaningful selection. Choosing a meaningful song unique to both of you will add a personal touch to your first dance. In addition to sharing a loving first dance with your new spouse, most couples will be sharing other special dances with their parents. Depending on the situation and relationship, possibly with siblings or other family members. You have the opportunity to pick many meaningful and classic songs to dance with that special person. You can also surprise them with a song they love or always envisioned sharing with you. Other key song choices for my wedding reception would be making this part FUN! Choose an upbeat or meaningful song to be played in the background while you cut your wedding cake. Something that your guests will sway and even sing along to. This will add a great atmosphere for that photo opportunity and big kiss by your wedding cake. Eating time does not have to be boring. A Professional DJ can create a custom mix of music to be played during the courses or buffet based on your personal tastes. This is also a great spot to satisfy your older guests with sacrificing any dance time.